A Classic Rock, Noise Rock and Post-Punk Pastiche. Sing along choruses, monster guitar riffs and rock and roll sass. 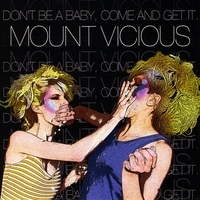 Let's be clear, Mount Vicious WILL rock you. Hailing from San Francisco and Oakland, with gigantic riffs, cutting bass, powerful drumming, intense vocals, and an unrelenting and urgent stage show -- Mount Vicious has what you need. Informed by classic rock as much as post-punk and noise rock, the bombastic intensity and power in Mount Vicious is palpable. Sit too close to your speakers and you might end up bruised or pregnant. Mount Vicious don’t just play rock, they ARE rock. Imagine Queens of the Stone Age covering Bon Scott-era AC/DC and The Minutemen, or the Eagles of Death Metal playing the Misfits and The Birthday Party -- you're on the right track, but still only getting part of the story. You do not, however, need a fancy record collection to enjoy Mount Vicious. This is rock and roll, this is immediate, and this is now. Give it a listen -- you will be howling along to "Wherewolf?" and preparing to get the horn from the "Steroid Unicorn" in no time at all. full force of Mount Vicious will be unleashed on the US during a coast to coast tour this July. These guys and gal never disappoint. Fist pumping, sing alongs, and rock and roll majesty are the orders of the day, and the fun they have on stage is as contagious as any pandemic. So, Don't Be a Baby, Come and Get It. I love this record!! Every song is a winner, and it's one of the best I have heard of the year so far, there is little more to say other than that. RIYL: Hot Snakes, Eagles of Death Metal, Queens of the Stone Age, Misfits, fugazi. It's not noise-rock, but it certainly rocks. This record kills, that's all you need to know. LOVE!! More please.